Agape Pools Website, Don’t You Want to Jump Right In? We recently launched the website for Agape Pools and Outdoor Spaces, sister company to Beverage Building. Agape creates beautiful outdoor living spaces in Shreveport, Bossier, and beyond – and they needed a website to showcase their work! Our design inspiration came from the colors and styling of the company’s logo and, of course, photos of their gorgeous pools and outdoor living spaces. One of our favorite design touches is the homepage photo of feet dangling in the pool – doesn’t it make you want to jump right in? The focal point of the website is the photo gallery; two separate, complementary settings for the pools and the outdoor spaces. As this growing company adds projects to their portfolio, users can easily navigate between the two sides of the business. 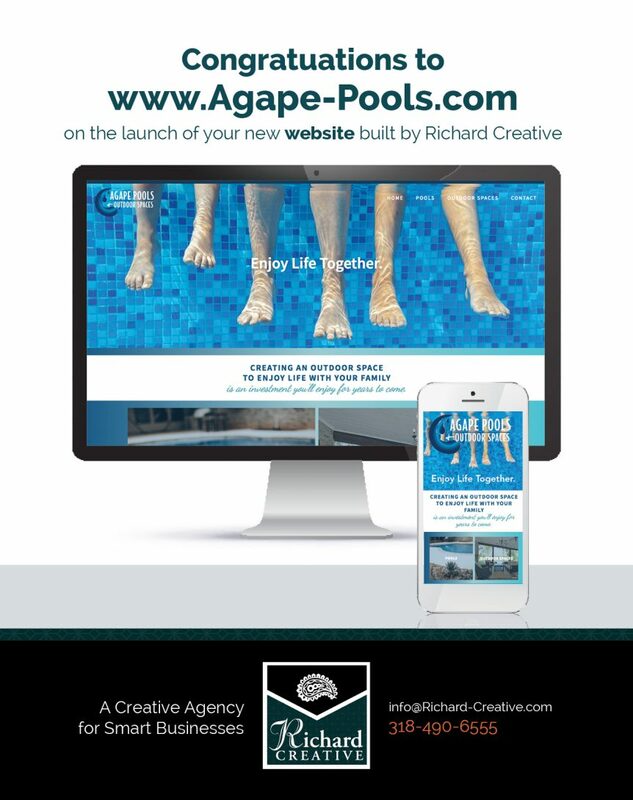 As Agape Pools & Outdoor Spaces continues to grow, they plan to add new pages to feature new services – an easy task on a Richard Creative website! We design websites that are built to grow with your business, and we can add to your online presence as you expand. If you are interested in investing in a pool or creating an outdoor living space your family will love, explore their website at http://agape-pools.com/!